Gold City: “Oh What A Day” – Originally recorded on Portrait, this song was basically album filler. With its subsequent release as a live cut on Indiana Live, the song sounds brand new, and a great live mid-tempo cut. Ivan Parker sings the fire out of the second verse on the live version, and Brian Free’s tenor lead on the key change is spectacular. The live cut is much better. 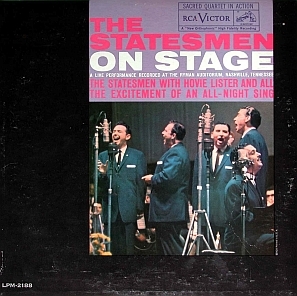 Statesmen: “Get Away Jordan” – The studio version of this song, on the Skylite album by the same name, is paced much slower. The live version, on On Stage, has gone down as one of the greatest cuts in SG history. Nothing more to be said here. Collingsworth Family: “I Can Trust Jesus” – The studio version of this song is found on We Still Believe. On the group’s live album from last year, Your Ticket To Music Hall, the song is performed live, and comes across much more powerfully, especially with an acappella encore of the chorus with Kim coming in with light piano accompaniment. The live version takes a good song and makes it a great song. Can you readers come up with other songs that had been released on a studio album, but their subsequent release on a live album far outshines the original studio cut? After Nate posted yesterday on the Daywind/Skylite releases, I got a call last night from a good friend (hat tip, BS) with some more information on the releases. These are actually two complete Skylite albums being released on a single CD. My friend had actually found a couple of copies, even though they are supposed to release on Feb. 24, according to Amazon, and they are of very good quality. He picked up copies of the Statesmen, Blackwood Brothers, Masters V, and Oak Ridge Quartet, and also saw a Speer Family CD. I did a little digging on Amazon.com, and found them listed. Here’s the link to a few. This is great, I’m glad to see that Daywind is releasing full albums instead of just compilations of Skylite era stuff. I believe that the ORQ Sing and Shout was released while Skylite was still owned by the Blackwoods and Statesmen, so the possibility for Jake and Rosie era Statesmen and JD era Blackwood Brothers releases seem to be pretty high for future rereleases. Keep an eye out for these! Daywind to release Skylite Recordings? I got the following email from a friend of mine last week (hat tip, DP). I was hoping Singing News would have their March issue online before I posted this but as of a few minutes ago they haven’t. Daywind is Releasing a double CD of the old Skylite Recordings. Blackwood Brothers, Statesmen, Speer Family, Masters V, Oak Ridge QT and JD Stamps. This would be great! I’d love to see them release these older records as Canaan has. It would be even better, in my opinion, if they were releasing the complete albums.